From the world of Forgotten Realms! The MOST POPULAR CHARACTER from the MOST POPULAR FANTASY WORLD of all time comes to life in his FIRST ORIGINAL comic book tale. 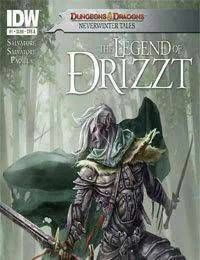 DRIZZT leads this massive thriller into Salvatore's next blockbuster novel! Don't miss this prequel! Don't miss any of the Neverwinter projects coming out this year!